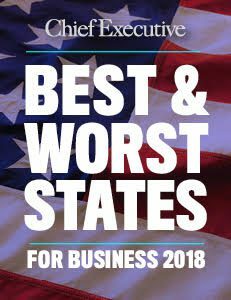 Rhode Island engineered the most dramatic leap of any state in the 2018 Chief Executive “Best States / Worst States for Business” survey with an approach that is almost always guaranteed to be effective with CEOs: making it much easier to do business. America’s tiniest state jumped 10 spots, to No. 32 from No. 42, after Gov. Gina Raimondo and the state’s legislature, economic development team and business community worked together to enact significant cuts and other reforms in various taxes and overhauled expensive government pensions. “There’s been a series of deliberate and proactive steps that we’ve taken to change the perception of Rhode Island,” Stefan Pryor, the state’s secretary of commerce, told Chief Executive. David Osborne would attest. The CEO of Virgin Pulse, a global software company, recently moved its headquarters to downtown Providence from Framingham, Mass., after buying a smaller, Providence-based concern called Shape Up. Osborne had aggressive growth plans and wanted to leave Virgin Pulse’s suburban office environs for a vital downtown teeming with the kind of millennials he needed to hire by the dozens. Why? Osborne cited the city’s “open, hip culture, great restaurants, and great vibe” as well as four to five “great universities” and other infrastructure elements, including a jobs program launched by Gov. Raimondo. The cost of doing business and the cost of living also are materially lower than in Boston. “We can also borrow from the Boston talent base,” he said. Wexford Science & Technology is partnering with Brown University to create a “knowledge community” around the school’s $220-million redevelopment of an old power station on the Providence River, plus student housing and a parking garage. The idea of these “innovation districts” is to establish a university-centric, mixed-use development that is built on a foundation of research and entrepreneurism. Laurie White, president of the Providence Chamber of Commerce, said that one key to leveraging a more business-friendly approach was to ensure that it targeted industries where Rhode Island enjoyed advantages over other locales, mainly those driven by its esteemed higher-educational institutions. White said that another key to more CEOs noticing Rhode Island is that the state has begun talking itself up more in significant ways outside its borders, including at trade shows, site-selection forums and even a “social-innovation summit” outside Chicago. 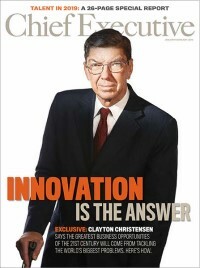 Rhode Island has taken out a flurry of advertising in prominent print publications as well.